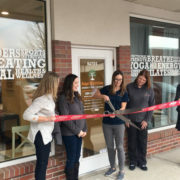 Earlier this week, Sage Nutrition celebrated the opening of their new location in South Lincoln with a ribbon cutting ceremony and open house. Guests ranged from Lincoln Chamber of Commerce members to college students. Everyone got the chance to tour the new space which features an exercise room where Mindful Movement Coach, Cathy Jewell, leads group and individual sessions, a full kitchen for cooking demonstrations, a cozy seating area, and offices for Lora Unger, Emily Estes, and the newest member of Sage Nutrition’s team, psychologist Heather Patterson Meyer. While enjoying snacks and entering raffles those in attendance got to hear a bit about what drove Emily to create her own business. With inspiration from friend and mentor, Karen Miller, Emily saw a desperate need for eating disorder treatment and nutrition counseling in Lincoln. Through a holistic approach, Sage Nutrition offers just that. Emily focuses on weight management, intuitive eating, and eating disorders while Lora Unger works with prenatal, early childhood, and sports nutrition. Sage Nutrition emphasizes the importance of a healthy relationship with food and exercise, not just counting calories. While its not always easy, everyone is capable of leading a healthy life and the new location is a great place to start! To make an appointment call (866) 818-7481 or visit our website for an online consultation.